The cessation of hostilities in Syria almost certainly does not mean the end of the Syrian war, as US, Turkish and Saudi proxies are using the timeout to regroup, rearm and prepare, according to former MI6 agent and EU foreign policy adviser Alastair Crooke. The Syrian ceasefire deal, brokered between the US and Russia, almost certainly will not last long and definitely does not mean the end of the war on the ground, Alastair Crooke, former MI6 agent, who was Middle East advisor to Javier Solana, High Representative for Common Foreign and Security Policy of the European Union (CFSP) from 1997 to 2003, said in a lengthy interview with the RT news channel. The British diplomat analyzed the possible intentions of the parties of the deal. “And one of the intentions is to have a break, a pause, I think, so that your own proxies — the American, Turkish, Saudi proxies — can regroup, can rearm and prepare,” he therefore suggested. At the moment, Crooke explained, for the rebels, the negotiating hand is vanishing day by day and if the Syrian forces reach Raqqa, they will have almost nothing. Their major purpose is stopping the government forces getting to Raqqa, because then what’s there to negotiate about? The negotiations are taking place on the ground, in the battlefield, Idlib and Aleppo in the north of Syria, he suggested. The Syrian government forces have already established control of strategic heights in the Raqqa province. “It would be very important if the non-American, the non-Turkish forces can take both Raqqa and Mosul. It will end the idea of creating a wedge in the Middle East of a Sunni state that is under the influence of Turkey and Saudi Arabia and acts as block between Iran and the Mediterranean and between Iran and Syria,” he explained. The former MI6 agent also pointed out that, interestingly enough, those who are fighting in Syria, are, in fact, different US-backed groups fighting each other. “It’s clear that there are different elements within America. 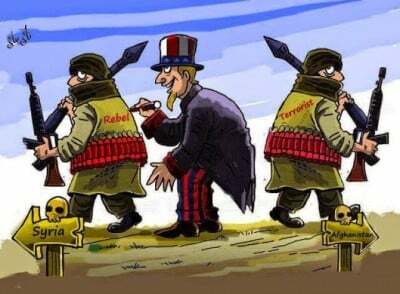 We’ve seen that the Defense Department had quite a different position from that of the CIA, and so, at the moment, what we are seeing in Idlib, for example, is that the American-supported Syrian Kurdish groups are actually fighting some of the groups that the CIA have trained. So you have American supported groups fighting American supported groups in the area around Aleppo. So yes, there are differences in the American administration in that area,” he said.